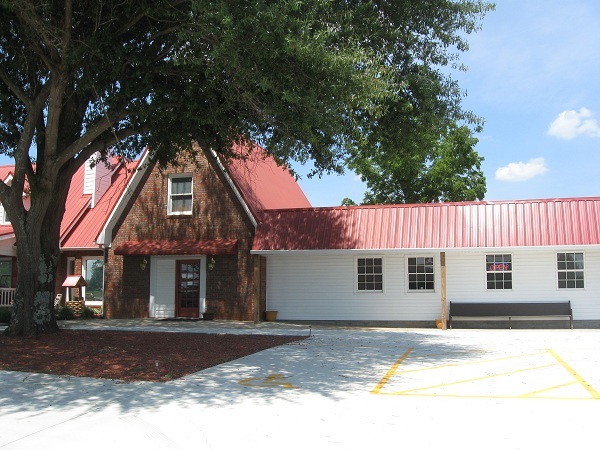 Green Acres Restaurant, Carnesville GA (CLOSED) – Marie, Let's Eat! Marie had one of those bad feelings that work often gives you. We were supposed to get out of town around ten Friday morning, and suddenly there was a one-hour meeting scheduled at ten. I suggested we just leave half an hour early, my son and I would drop her off for the meeting and play some mumbledy-peg while she made sure the corporate world survived another week. Then she concluded she should probably go in at seven and get some work done. Before she knew it, she’d be talking like that fellow in Clerks about how she wasn’t even supposed to be here, and we didn’t even leave Atlanta until most folk were coming back from their lunch hours. Fortunately, I had already asked around for a backup plan in case her job exploded like this. I was hoping to get on the road and make it to Spartanburg for lunch at a well-known place, but since we left so late, we stopped instead in the small town of Carnesville, about fifteen miles this side of the South Carolina line. This marks the second time this summer that we had planned to get lunch in South Carolina while on our way to Asheville, only to have to revisit plans and eat in Georgia instead. I’m not sure what’s going on with that. At any rate, there’s a very helpful fellow at roadfood.com who goes by the handle “Littleman” who apparently keeps a remarkable spreadsheet of every interesting hole-in-the-wall, high-end and hidden restaurant in the southeast. Green Acres Restaurant has only been around, in this incarnation, for nine months, but it’s already made it into his research and I’m glad it has, for this place is quite neat, and exactly the sort of thing people who don’t know better would drive right past. From the road, Green Acres doesn’t look like much of anything. Somebody took a house on a huge plot of land and bolted on a business add-on. From the inside, this proves to be a clever and actually quite attractive bit of architectural magic, but from the outside, it sure isn’t photogenic. We arrived a little after two, more than ready to eat. Sadly, the late hour meant that we couldn’t justify ordering either of the house’s crazy specialties, half-pound burgers with two sides with the ridiculous names of Cheezy Weezy and Zip Burger, which each require a twenty-minute prep time. These are apparently deceptively difficult to finish and thwart more attempts than people think, although there is a photo on the wall of some mad teenager from the nearby town of Commerce who handled four of the blasted things in a single sitting. Sixteen years old and he already looks like a character from a Judge Dredd episode. We each ordered different things to share. Marie had a regular burger with potato salad and some very good corn on the cob, I had two chili dogs with fries and mac and cheese, and my son had chicken tenders with black-eyed peas. Sad to say that Marie didn’t like her potato salad much, but everything else turned out to be very good, particularly the burger, which was cooked exactly right and was flavorful and juicy. 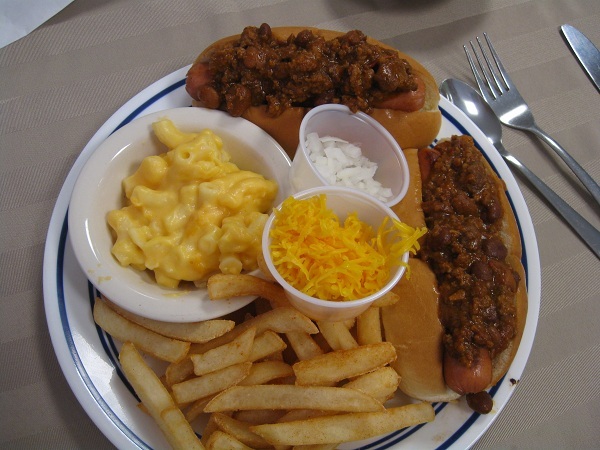 I quite liked the chili on the dogs, and I like the way they serve it with the little bowls of diced onions and shredded cheese. There’s a hint more Sysco in the fixings and condiments than would be ideal – whoever you are and wherever you are, you’ve had these fries before – but the owners have done a splendid job putting together a fine little community family restaurant. I imagine that this place is pretty friendly and quiet most of the time but gets really busy and wild in the evenings; the photos on the wall of Zip Burger victors indicates this is a great Saturday evening out, particularly with the all-you-can-eat catfish on offer that night. Actually – and this is not to knock the perfectly good late lunch that we enjoyed – the best part of our visit was learning a little about the place. It’s family owned and operated, and takes its name from a restaurant that the owner’s grandfather opened in the Gwinnett County town of Buford in 1951. She brought out an old menu from the old place – a wonderful little treasure and artifact from the days before digital photography and social media made such things so commonplace. The restaurant was destroyed by fire after a few years; family lore holds that it was the work of a certain white supremacist hate group you might have heard of. I’d hate to find many more tales as awful as that in the histories of restaurants, but we’re having fun learning about them as we go. Posted on July 25, 2010 July 29, 2017 by Grant G.Posted in athens, casual american, georgiaTagged athens, burgers, carnesville, casual american, georgia.